A plantar wart feels like a lump under the foot. They are only painful is they are squeezed or pinched from side to side, or if you bear direct weight on them. Warts on other parts of the body, such as the hands, grow elevated above the skin's surface. We bear weight on warts on the bottom of the foot, so they get flattened and pushed into the skin. Most people liken this to walking with a rock attached to the foot, as the thickened callous tissue becomes hard and painful as it gets bigger. 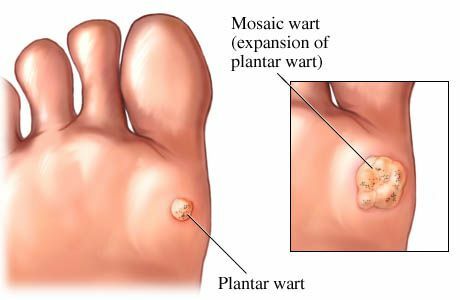 A plantar wart can usually be diagnosed by your doctor based on a characteristic appearance alone. When the doctor trims the hard callus tissue from the surface of the wart, a pattern of small black dots that are actually small blood vessels that feed the wart, is usually seen. The doctor will also test the wart by pressing directly down on it, and then pinching it, squeezing it from side to side. Most warts won't hurt when pressed directly down, but are very painful when pinched. If these findings are present, no further testing is necessary to identify a plantar wart. All warts are caused by the Papilloma virus, a slow growing virus which invades the skin. The viruses are common in all of our environments and they don't readily grow on intact skin. But if there is a break in the skin, like a scratch or thorn penetration, this gives the virus the opportunity to get in and start growing. The virus only grows in the epidermis, the thick layer of the skin closest to the surface. It doesn't invade the dermis, the deeper layer of the skin. The wart virus thrives in dark, moist areas such as pool areas, bath tubs, jacuzzi areas. It is highly recommended to wear sandals in this areas to prevent contamination. Warts are also very contagious. Keep your feet clean and dry. Inspect feet frequently for new warts and begin treating small ones immediately, before they increase in size or number. Warts are most common in children which is why our team has developed a painless treatment protocol. The process involves debriding the skin and treating the area with very high potency salicylic acid. Patients then do at home treatment for 3 weeks, then follow up. It is painless and allows children to be treated effectively without scary needles or freezings. While those option may be quick, they are often very painful and involve a long healing process.